This step offers you to choose a location and filename for backup file - a file where all chosen Outlook data will be stored. Figure 8. Where to back up. After the place for a backup file is selected, specify the backup filename. Since Unicode is fully supported in ABF Outlook Backup you are free to name the backup file in any language you wish (Figure 8; Pos 2). You can create self-extracting backup file by checking an Self-extracting backup file checkbox (Figure 8; Pos 3). Note: Self-extracting backup file cannot be created on drives with free space lower than 2 MB. 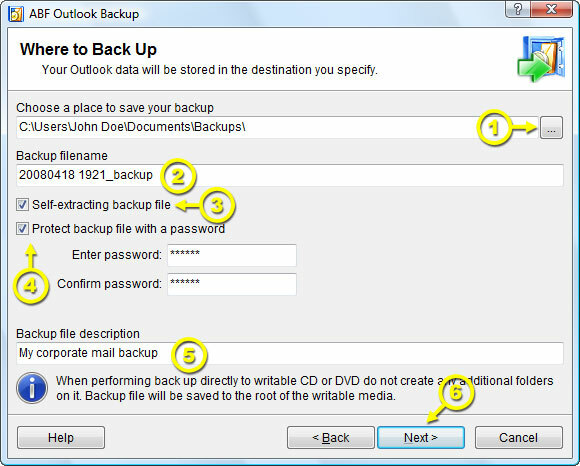 To ensure no one else can access you private Outlook data you are able to protect backup file with a password (Figure 8; Pos 4). You may add some comments for the backup file by filling Backup file description (Figure 8; Pos 5). (Figure 8; Pos 1). Additional disc burning settings are available in Disc burner options in Advanced part of the wizard. Warning! Please do not create any folders and sub-folders on CD or DVD you are burning to. Otherwise the conflict between program internal burner and Windows burner may occur. The backup file will be saved to the root of the writable medium. Click Next (Figure 8; Pos 6) to proceed to the next step.